If you have been feeling the need to rethink the way you eat, here is a great and completely “do-able” way to make that change. This flexible 12 week plan is NOT a diet and does NOT use any weird and wonderful foods. It is purely a healthy plan that uses real foods AND within a time frame that allows for and encourages habit and behavioural change. There are no major changes or unachievable outcomes and all suggested foods are delicious, affordable and easy to prepare and cook. 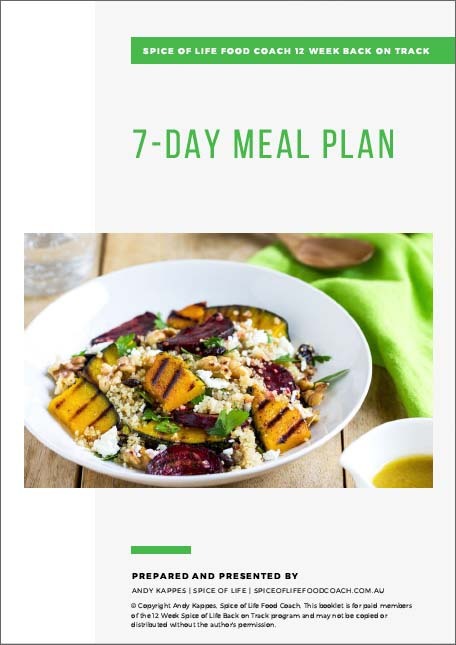 As part of the 12 week back on track membership, you'll have access to a 7-day meal planner including recipes and a full week's shopping list.